“With Kafka, people go crazy about getting the original manuscript — not a photocopy, not a facsimile,” Meir Heller [attorney for Israel's National Library] once remarked to me. 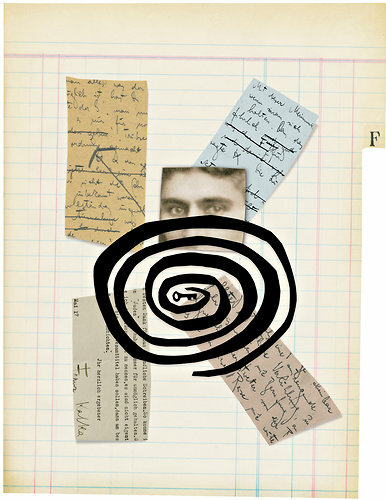 “With most writers, once there’s a copy, nobody cares.” We fetishize the original manuscripts, because they seem to offer some access to a definitive Kafka — a Kafka beyond Brod. But this, too, is an illusion. The manuscripts aren’t definitive, because definitiveness, for better or worse, is the product of deadlines and editors and publishers: things Kafka either went out of his way not to have or ended up not having because of bad luck, tuberculosis and the First World War. When Kafka did prepare manuscripts for publication, he spent much time correcting mistakes and decoding his own abbreviations, sometimes even enlisting Brod’s help; one critic thus speculates that “Brod’s version might, in the end, look more like what Kafka would have published” than the most meticulous German scholarly editions. Maybe there is no Kafka beyond Brod. And, at the polar opposite of archiving a deceased author's papers, is the story of how David Markson's annotated books ended up at The Strand bookstore. Addendum: I'll admit it, since I live in Tel Aviv, I did ride my bike up to Spinoza Street this evening to take a look at the house where the manuscripts were supposedly held. The lights were off and it's a pretty dark street so I couldn't see much of anything, but there were certainly a lot of cats around and it kind of smelled like a litter box.